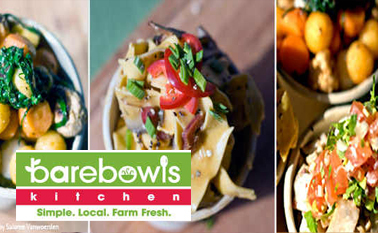 Bare Bowls Kitchen is an excellent, local food-oriented food truck focused on quality ingredients. They usually have their schedule posted online. Features lots of great, fresh, and local ingredients in their meals, and done at a fair price, living up to its purpose of Providing high quality food, highlighting ingredients that are momentarily in season, at an affordable price from a clean and inviting atmosphere. Overall a fantastic truck. Fresh. Friendly. Way beyond delicious. You should check out the website to know where the truck will be parked next. If you want real food that's packed with fresh and organic ingredients, head on to Bare Bowls Kitchen.